The religious education class that I teach ended this week. It is shorter than the school year running from October to the end of April. I am looking forward to a break and having another free day during the week. I am also looking forward to starting back up in the fall and my brain is already racing with new ideas to try out and projects to create. For the last session, we decided to play bingo. 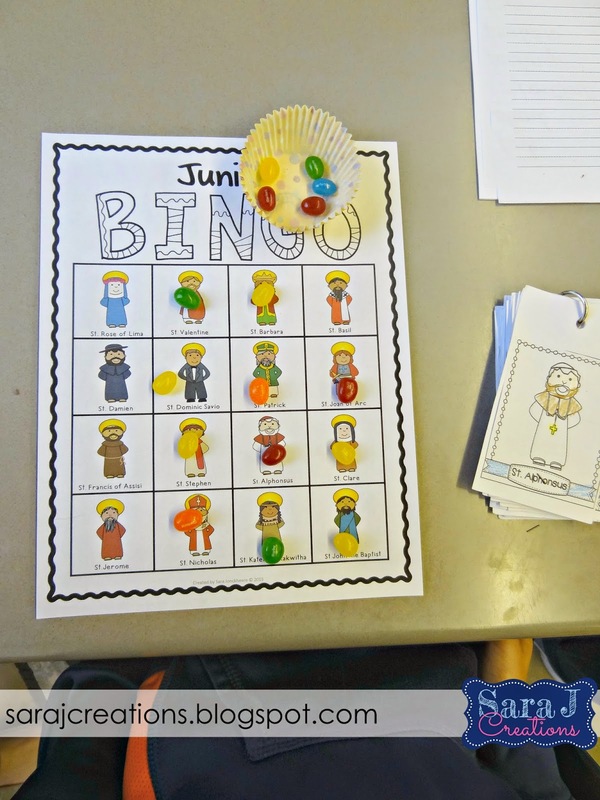 We played bingo before Easter (from my Religious Easter Bingo pack) and the class loved it. They needed some help finding the squares but with that game there were a lot of picture clues. I wanted to do a Catholic Saint Bingo to review the saints we learned about this year. I blogged HERE about how we made flip books and learned about a new saint each week. 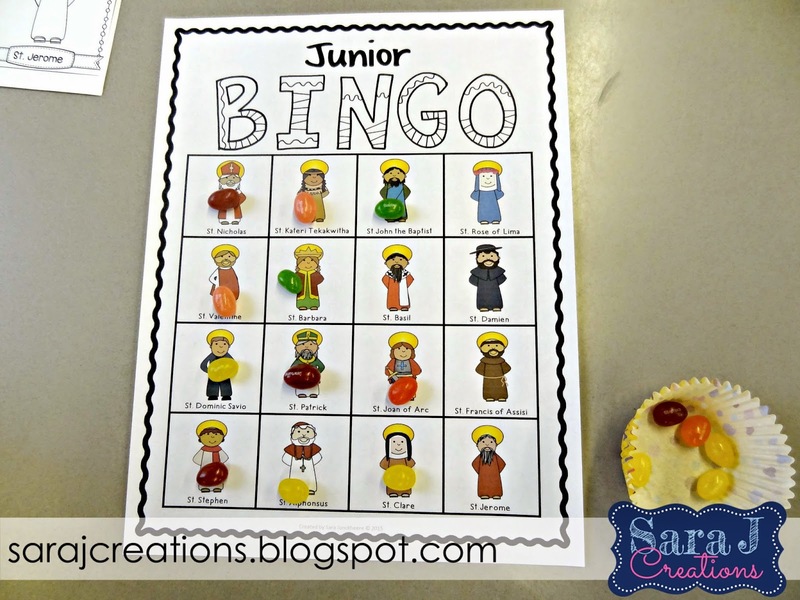 After playing Easter bingo, I decided I needed to make a junior version of Catholic Saints bingo so that it was more manageable for first graders. Many of the saints look similar so I knew they wouldn't have as many picture clues to help them. I made this version with only 16 squares instead of the 25 in my regular version. For the first few rounds we called the saint's name and then held up the mini poster to help them find it on their boards. They also had their flipbooks out if they needed them. Then, after awhile, we started giving them clues about the saints (included in the bingo game) to see if they could remember who we were describing. I was shocked by how much they knew and remembered about each saint. They had so much fun playing and could hardly contain their excitement. About half of them played standing up because they couldn't stay in their seats. In the interest of full disclosure, I have to tell you about my teacher fail moment while we were playing this game. So when I create my bingo games, I systematically move the images around to ensure that I create 30 different bingo boards. That way you don't have all the kids getting bingo at the same time, right? 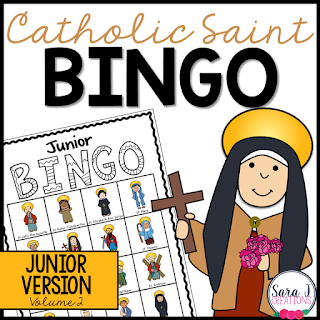 Well I had no problems when we played Easter bingo so I didn't foresee any problems with Junior Saint Bingo. And then most of the class got a bingo at the same time. What? Okay random fluke, right. We did it again and it happened again the next round. The kids didn't care or seem to notice a problem and neither did my mom (we teach together) or the head of religious education who was in the room observing. But as a TpT creator, it was driving me crazy. Why did this happen? I was guessing it was because of the smaller amount of spaces on the board and the fact that it was an even number. I couldn't wait to get home and ask my husband about it. His engineering mind can understand that sort of thing way better than mine can. He told me if I kept if the way it was and then just flipped one or two on each board, it should be fixed. So I fixed it and re-uploaded it to my TpT store. Crazy. I never saw that coming. I knew each board was different so I figured they would all win at different times. Now I know that creating junior versions are a little different. UPDATE: I've created a second version of Catholic Saint Bingo. This one has different saints than the others and was designed specifically for my religious education students because every saint that is included can be found in our church through pictures, artwork, statues, etc. 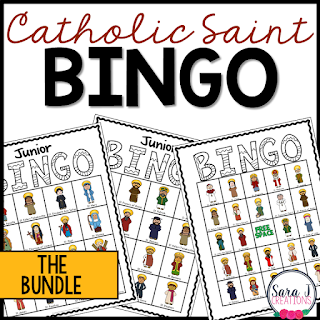 You can find all three versions of Catholic Saint Bingo in my store by clicking on the pictures below as well as the money saving bundle.